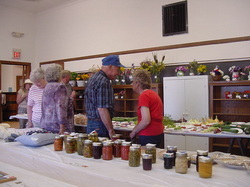 First and foremost, the fair is here because of exhibits. Please enter at least one item to make this year's fair the best ever! Regulations and Premium Lists are available on this site or from Jody Luecken at 218-376-4648. Entries are accepted on Saturday morning from 9:00 to Noon. Click on Youth or Adult to see the premium list. This will tell you what may be entered as well as details on how entries should be prepared. There are so many talented people up in these North Woods! Check out the creative, quality goods at the Bazaar. If you are interested in bringing something to sell, Contact Hazel Kehoe at 218-969-3755 for more information. Treasures old and new are found by poking around at the Market booths! You never know what you will find - from Antiques and Gently Used Items to wonderful items from Direct Sales companies, to newly crafted products and fresh baked goods. Contact Jane at 376-4556 for further information regarding setting up a table. The Softball Tournament will be happening on Saturday and Sunday on two diamonds - the one at the Fairground and the one across the road behind the Viking Bar. It's been YEARS since we've had the fun of dunking someone - or being dunked. C'mon over to get all wet. Anyone willing to SIT on the Dunk Tank? Give Jane a call at 376-4556. Sitters must be at least 16. We need YOU!!! If you are willing to step up and help out, please call Jane at 376-4556. The Exhibit program is very important to the fair, and we need you to take part in that as well. Exhibits are the reason for Fairs in the first place, and it would be sad to have to discontinue the "heart" of our wonderful Bear River "Get-Together." Have you made anything in the past year? Photos? Crafts? Woodworking? Bring it! Do you have a garden? Bring some fruit or veggies! How about house plants? Take 'em along! Exhibits! Food Booths! Beer! Bingo! Bear River Shirts for Sale! Tickets are available in advance for the Pig Roast by Mark's Country Market. It's a wonderful meal for just $12! 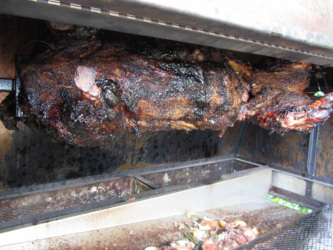 Live music at the Pig Roast will be provided by the Lake Street Gang from - 4:00-8:00. ​Contact Jane Bartlett at 376-4556 or one of the Fair Committee for tickets. Popcorn, cotton candy, wraps, hot dogs, polish and nachos - along with a variety of soft drinks and beer will be offered on site both Saturday and Sunday. Dinner: A delicious dinner of Swedish Meatballs, Mashed Potatoes & Gravy will be served on Sunday afternoon from Noon to 2:00 p.m. inside the building. Pie and Coffee will be served from 2:30 until it's gone. "Kids" 12 years old & over are invited to take part in a Scavenger Hunt on Sunday. Prizes will be: $50, $25 & $10. The Bouncer will be back this year! Adventure may be had with rides on the train and stagecoach as well! Bear River Church will be conducting outdoor Worship Services at the Fair on Sunday morning at 10:30. ​Synod Minister Gloria Hegg will be conducting the worship service. We've got some GREAT prizes - 1st prize is a 10' Kayak, 2nd prize is a Trail Cam, 3rd prize is an Instant Pot, and 4th prizes are Too Numerous to Mention! Tickets are available from many local folks. Just ask whoever you see! Or... contact Jane at 376-4556. Get Ready to join the fun, food and fellowship of the Annual Bear River Fair!